Baldoyle Library is located in a two-storey turn of the 20th century building fronting Strand Road that was originally constructed as a Royal Irish Constabulary barracks. The library extension project arose from the need to allow for increased accessibility to the existing building as well as for additional library and office space. Our team provided civil and structural engineering services for the development. The scheme included for a 260m² extension to the rear and side of the existing building across two floors. Upgrading works were also carried out to the original building, including provision of new floors and roof in addition to the installation of a new lift. The new space provides for offices, meeting rooms and exhibition space. Ground conditions at the site were very poor, comprising layers of loose sands and soft silts overlaying gravel, and low vibration piled foundations were used to support the new building. The superstructure comprises a glazed wall at ground floor with an in-situ concrete box structure used for the first floor and roof construction, giving the appearance that the building is ‘floating’ over the exhibition space. 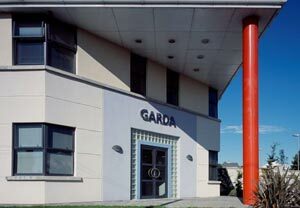 Thomastown Garda District Headquarters is a new facility providing accommodation for the South Eastern Region Traffic Division of the Gardai. 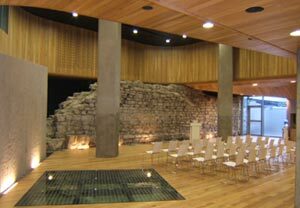 We acted as civil and structural engineers on the restoration of the Civic Offices basement. 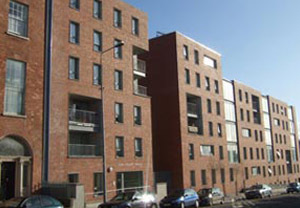 This award-winning 54-unit social housing scheme in the heart of Dublin includes a mix of apartments and townhouses over a single level basement. 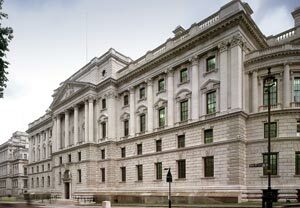 Waterman provided multidisciplinary services for the modernisation of the Government Offices Great George Street (GOGGS).